Definition at line 120 of file llfollowcam.h. Definition at line 260 of file llfollowcam.cpp. References LLQuaternion::DEFAULT, LLFollowCamParams::mDistance, mPitchSineAndCosineNeedToBeUpdated, mSimulatedDistance, mSubjectPosition, mSubjectRotation, mUpVector, mZoomedToMinimumDistance, LLVector3::z_axis, and LLVector3::zero. Definition at line 668 of file llfollowcam.cpp. Definition at line 508 of file llfollowcam.cpp. References DEG_TO_RAD, LLFollowCamParams::mPitch, mPitchCos, and mPitchSin. Definition at line 272 of file llfollowcam.cpp. References params, LLFollowCamParams::setBehindnessAngle(), LLFollowCamParams::setBehindnessLag(), setDistance(), setFocus(), LLFollowCamParams::setFocusLag(), setFocusLocked(), LLFollowCamParams::setFocusOffset(), LLFollowCamParams::setFocusThreshold(), setPitch(), setPosition(), LLFollowCamParams::setPositionLag(), setPositionLocked(), and LLFollowCamParams::setPositionThreshold(). Definition at line 653 of file llfollowcam.cpp. References mRelativeFocus, mSubjectPosition, and mSubjectRotation. Definition at line 647 of file llfollowcam.cpp. References mRelativePos, mSubjectPosition, and mSubjectRotation. Definition at line 659 of file llfollowcam.cpp. Definition at line 563 of file llfollowcam.cpp. Definition at line 570 of file llfollowcam.cpp. References f, mUpVector, p, setFocus(), setPosition(), and u. Definition at line 590 of file llfollowcam.cpp. References LLFollowCamParams::mDistance, mSimulatedDistance, mZoomedToMinimumDistance, and LLFollowCamParams::setDistance(). Definition at line 613 of file llfollowcam.cpp. References f, gAgent, LLAgent::getPosGlobalFromAgent(), LLFollowCamParams::mFocus, LLFollowCamParams::mFocusLocked, mRelativeFocus, mSimulatedFocusGlobal, mSubjectPosition, mSubjectRotation, and LLFollowCamParams::setFocus(). Referenced by copyParams(), and reset(). Definition at line 636 of file llfollowcam.cpp. 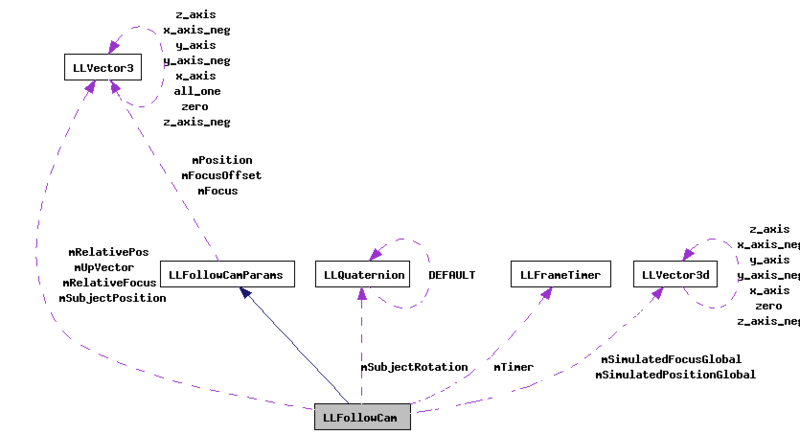 References gAgent, LLAgent::getPosAgentFromGlobal(), mRelativeFocus, mSimulatedFocusGlobal, mSubjectPosition, mSubjectRotation, and LLFollowCamParams::setFocusLocked(). Definition at line 578 of file llfollowcam.cpp. Definition at line 584 of file llfollowcam.cpp. Definition at line 600 of file llfollowcam.cpp. References gAgent, LLAgent::getPosGlobalFromAgent(), LLFollowCamParams::mPosition, LLFollowCamParams::mPositionLocked, mRelativePos, mSimulatedPositionGlobal, mSubjectPosition, mSubjectRotation, p, and LLFollowCamParams::setPosition(). Definition at line 626 of file llfollowcam.cpp. References gAgent, LLAgent::getPosAgentFromGlobal(), mRelativePos, mSimulatedPositionGlobal, mSubjectPosition, mSubjectRotation, and LLFollowCamParams::setPositionLocked(). Definition at line 516 of file llfollowcam.cpp. References mSubjectPosition, mSubjectRotation, p, and r.
Definition at line 298 of file llfollowcam.cpp. References calculatePitchSineAndCosine(), DISTANCE_EPSILON, f, gAgent, LLCriticalDamp::getInterpolant(), LLAgent::getPosAgentFromGlobal(), LLAgent::getPosGlobalFromAgent(), lerp(), LLVector3::magVec(), LLFollowCamParams::mFocus, LLFollowCamParams::mFocusLag, LLFollowCamParams::mFocusLocked, LLFollowCamParams::mFocusOffset, LLFollowCamParams::mFocusThreshold, LLFollowCamParams::mMaxCameraDistantFromSubject, mPitchCos, mPitchSin, mPitchSineAndCosineNeedToBeUpdated, LLFollowCamParams::mPositionLag, LLFollowCamParams::mPositionLocked, LLFollowCamParams::mPositionThreshold, mRelativeFocus, mRelativePos, mSimulatedDistance, mSimulatedFocusGlobal, mSimulatedPositionGlobal, mSubjectPosition, mSubjectRotation, mUpVector, LLVector3::mV, LLVector3::setVec(), updateBehindnessConstraint(), VX, VY, VZ, and LLVector3::z_axis. Definition at line 457 of file llfollowcam.cpp. References LLQuaternion::DEFAULT, f, FALSE, FOLLOW_CAM_BEHINDNESS_EPSILON, FOLLOW_CAM_MAX_BEHINDNESS_ANGLE, LLQuaternion::getAngleAxis(), LLCriticalDamp::getInterpolant(), LLVector3::magVec(), LLFollowCamParams::mBehindnessLag, LLFollowCamParams::mBehindnessMaxAngle, mSubjectRotation, LLVector3::mV, LLVector3::normVec(), RAD_TO_DEG, LLVector3::setVec(), LLQuaternion::shortestArc(), slerp(), TRUE, and VZ. Definition at line 524 of file llfollowcam.cpp. References f, FOLLOW_CAM_MIN_DISTANCE, FOLLOW_CAM_MIN_ZOOM_AMOUNT, FOLLOW_CAM_ZOOM_FACTOR, LLFollowCamParams::mMaxCameraDistantFromSubject, mSimulatedDistance, and mZoomedToMinimumDistance. Definition at line 173 of file llfollowcam.h. Definition at line 174 of file llfollowcam.h. Referenced by calculatePitchSineAndCosine(), and update(). Definition at line 175 of file llfollowcam.h. Definition at line 191 of file llfollowcam.h. Referenced by LLFollowCam(), setPitch(), and update(). Definition at line 172 of file llfollowcam.h. Definition at line 188 of file llfollowcam.h. Referenced by getSimulatedFocus(), setFocus(), setFocusLocked(), and update(). Definition at line 189 of file llfollowcam.h. Referenced by getSimulatedPosition(), setPosition(), setPositionLocked(), and update(). Definition at line 178 of file llfollowcam.h. Referenced by LLFollowCam(), setDistance(), update(), and zoom(). Definition at line 177 of file llfollowcam.h. Referenced by setFocus(), setFocusLocked(), and update(). Definition at line 176 of file llfollowcam.h. Referenced by setPosition(), setPositionLocked(), and update(). Definition at line 185 of file llfollowcam.h. Referenced by getSimulatedFocus(), getSimulatedPosition(), LLFollowCam(), setFocus(), setFocusLocked(), setPosition(), setPositionLocked(), setSubjectPositionAndRotation(), and update(). Definition at line 186 of file llfollowcam.h. Referenced by getSimulatedFocus(), getSimulatedPosition(), LLFollowCam(), setFocus(), setFocusLocked(), setPosition(), setPositionLocked(), setSubjectPositionAndRotation(), update(), and updateBehindnessConstraint(). Definition at line 184 of file llfollowcam.h. Definition at line 187 of file llfollowcam.h. Referenced by getUpVector(), LLFollowCam(), reset(), and update(). Definition at line 183 of file llfollowcam.h. Referenced by isZoomedToMinimumDistance(), LLFollowCam(), setDistance(), and zoom().